A few weeks ago, I left my large backpack behind in favor of a small day pack for a week and headed out on an adventure to the Northern-most point in South America, Punta Gallinas in the Guijara Peninsula of Caribbean Colombia. 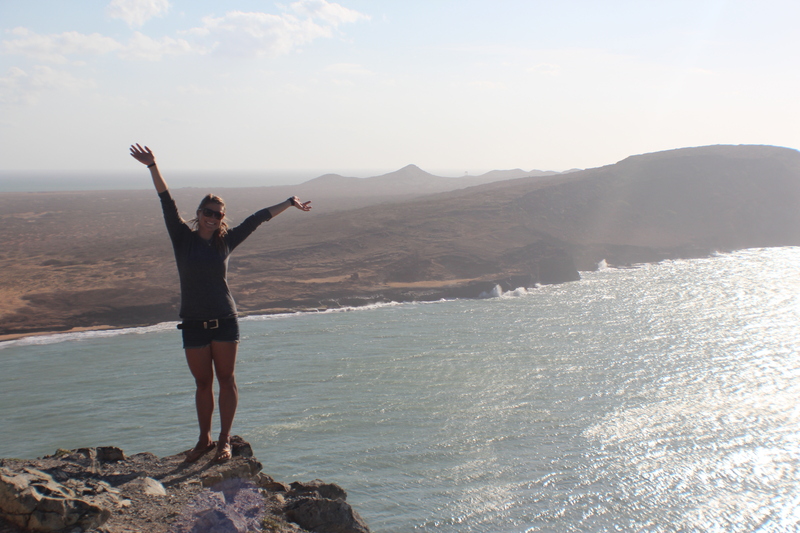 I knew from the moment I read the description about the small town of Cabo de la Vela situated near Punta Gallinas that I had to go see and explore the area. Rumors of missing people, a decrepit desert wasteland, non-stop gusting wind, and a tiny town of people surviving quietly without running water or internet was the description that told me that this was the perfect adventure fit for any brave yet curious traveler. Cabo is about four hours North of the city of Riohacha, but getting there was just the first challenge in my quest to see this desert wasteland. I had to catch a bus to an intersection in the highway called Cuatro Vias and then take a vehicle to Uribia, the closest town to Cabo. 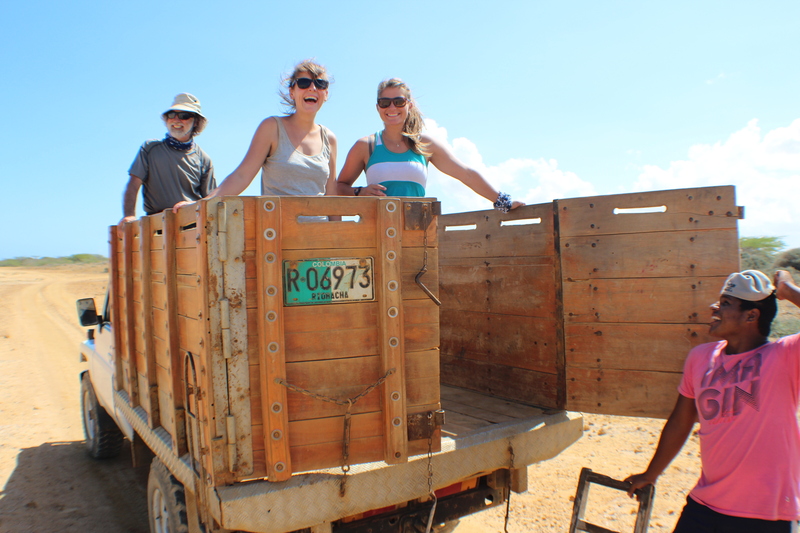 From there, you hop in the back of a pick-up truck with benches fitted into the box and begin the two hour trek across the desert, leaving all paved and graveled roads behind. 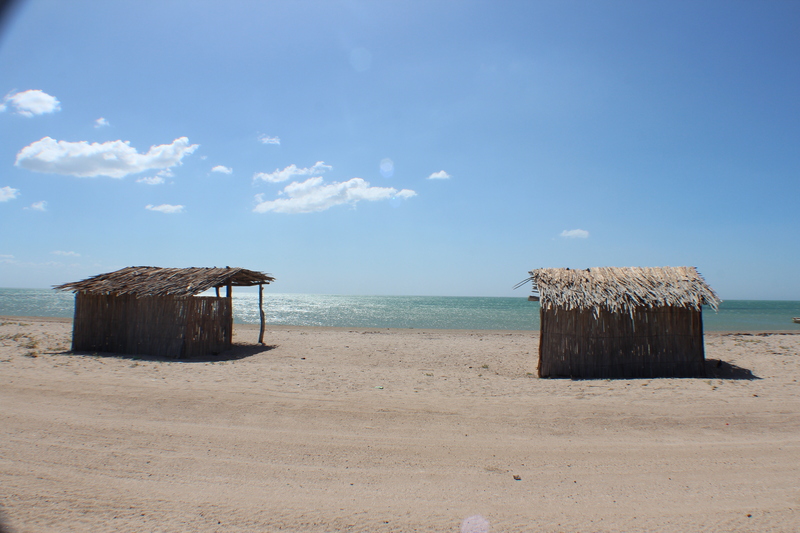 The very tiny town of Cabo de la Vela. This is a view of some of the shacks on the only street. I knew not to expect much when I arrived in Cabo, but I have to admit even I was surprised by what I saw when we drove up into the town. Nothing more than one simple street right along the ocean of dusty, wooden shacks pieced together with the occasional concrete building popping up between the shacks. Every house is a restaurant and hospedaje (hotel). And by hotel, I really just mean they string up a hammock for you to sleep in at night – your choice of beachfront or inside their three-in-one home. 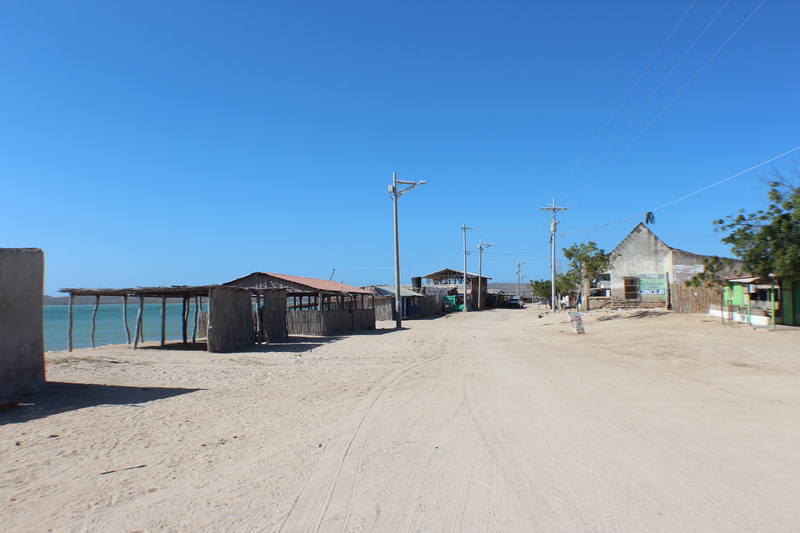 The street of Cabo de la Vela. Not much here. Our ‘room’ and ‘bed’ for the night. Literally steps from the ocean. A top of a view point overlooking the ocean and the mainland. I was lucky enough to travel to this area with another adventurous spirit, Paval, a Ukrainian living in American and we soon added a third partner in crime to our duo, Polly, a English girl from The Forest who has spent some time in Colombia. On our first afternoon, we explored a few sites around the town, climbing a mound just outside Cabo called Pilon de Azucar with spectacular views of the beaches below set amongst the craggy cliffs. Picture ocean waves splashing up on rocks strewn with vivid green seaweed and a backdrop of the dusty yellow sand and it really is a site to be seen. 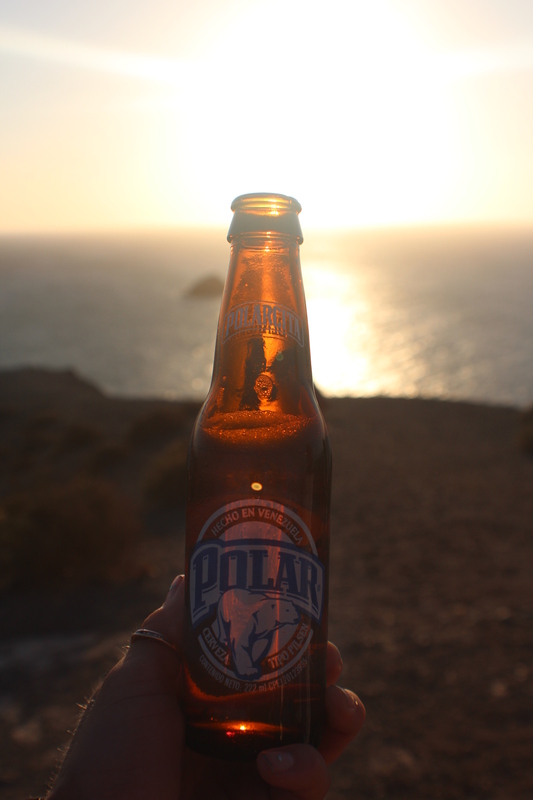 Smuggled Venezuelan beer at sunset at the look-out point. After a few more sites and beaches with spectacular views, we topped off the day of dusty travel with smuggled $1 CAD Venezuelan beers near the lighthouse for a view of the sunset over the ocean and headed back to town to feast upon a delectable $10 CAD lobster dish that was oh-so-succulent. 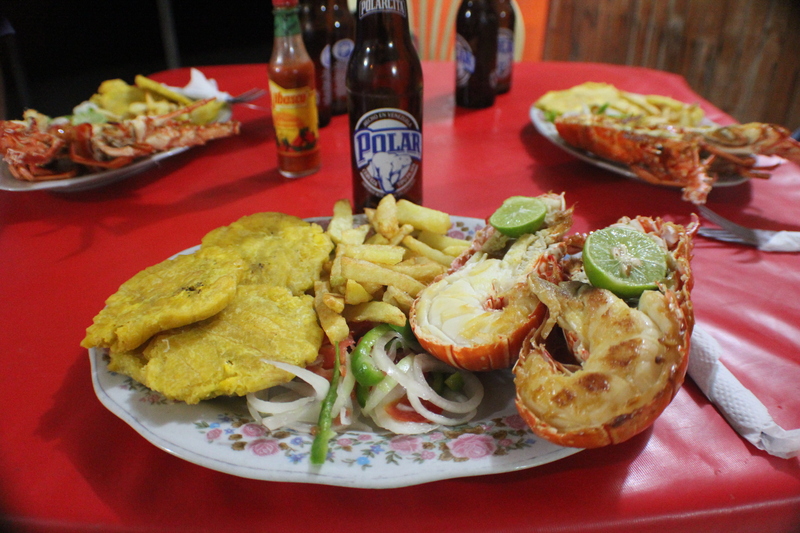 I haven’t tasted lobster so fresh and delicious since the Galapagos and it was a delightful treat after a long day. I’ve never tasted lobster so fresh and succulent in my life! After we had more than our fill and a few beers, we got to retire to our hammocks strung up in front of the beach for a cozy night of sleeping, until we were rudely awaken by a pack of dogs chasing a donkey down the beach in front of our hammocks at 3am. That and the painfully itchy sandflies that kept biting our ankles and hands. The three boys in charge of us six tourists heading through the desert. They were pretty funny and actually fairly responsible. The next morning, we were ready to go by 5am for our ‘tour’ up to Punta Gallinas, which consisted of three kids under the age of 21 driving a Chevrolet pick-up truck through the desert with their eager tourists in the box in the back. Six of us in total, we bounced and bumped along the desert for almost three hours, being covered by a fine mist of dust the entire time. I was constantly amazed at the impressive scenery swiftly changing from barren wasteland of nothing more than dusty, yellow sand and dirt to forests of cacti and prickly scrub brush to salt-flats and lagoons with flamingos and caimans hanging around. Oh, and throw in wild goats and donkeys everywhere and I quickly realized this is one of the most unique landscapes I’ve ever been to. 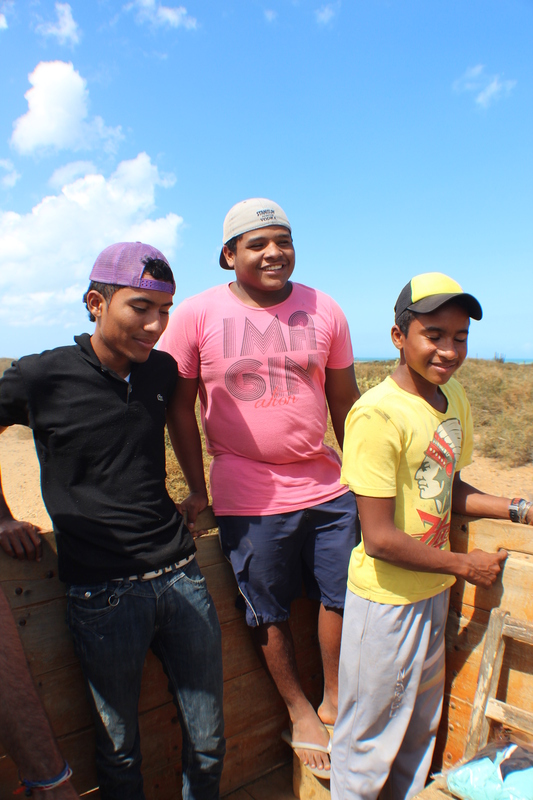 We arrived to what seemed the middle of nowhere, to stay with one of eight Indigenous Wayuu families in the desert. We had to leave the pick-up behind and jump in a boat for a short ride across a bay to their place and I was delightfully surprised by the accommodation. 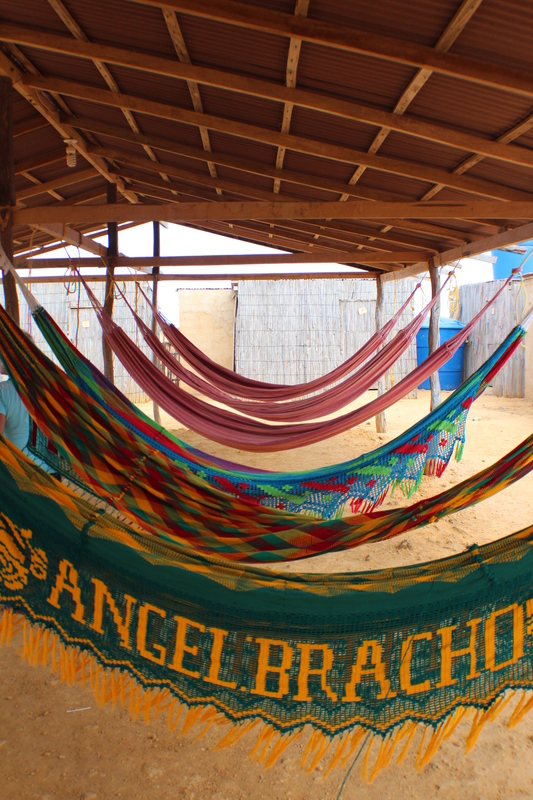 Again, only hammocks strung across some wooden beams, but running water, a mirror in the bathroom and some basic but excellent arepas, eggs, and fish for meals. Surprisingly the accommodation was much nicer than in Cabo de la Vela. 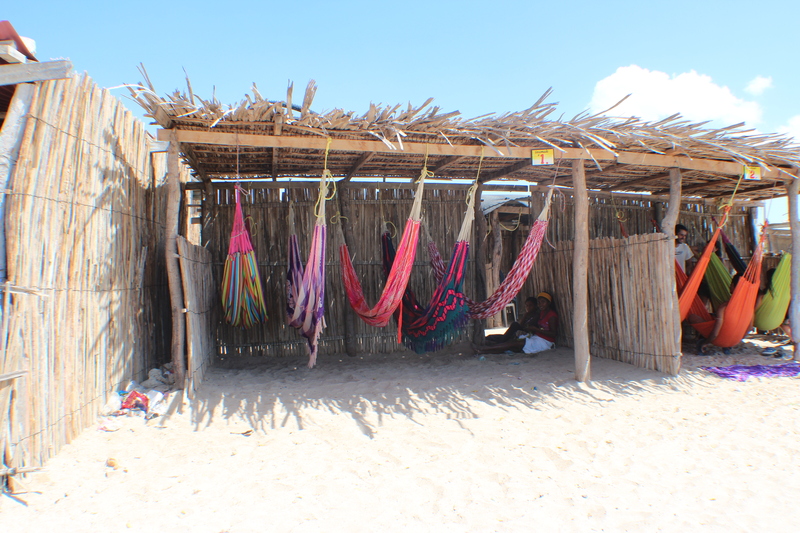 Our accommodation for the night at one Wayuu families home. After a quick breakfast, we hopped in another truck and ventured out to Punta Gallinas (Hen Point because it apparently looks like one). Nothing more than a tower, a crumbling concrete building whose purpose is still unclear with a map painted on the outside of it, an unending view of the ocean in one direction, and yellow desert in the other. The most Northern point in South America! After exploring the beach and finding some dried up shark and goat carcasses we continued to 60m tall sand dunes that spill down to a beautiful beach right on the ocean. We enjoyed an hour or two at the beach (only us six and our three tour guides. In fact, we didn’t see another tourist at all while we were there), and some sand and swimming before heading back to our home-stay at the end of the afternoon. 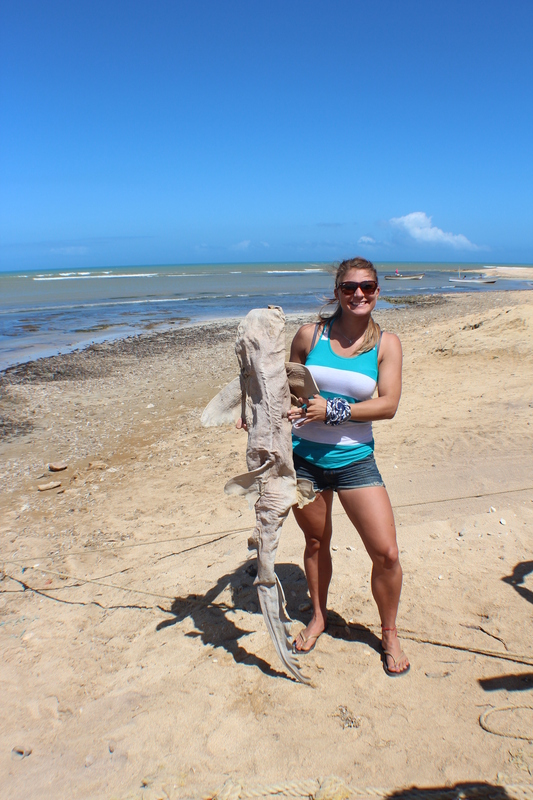 A self-professed biology nerd, I couldn’t pass up an opportunity to examine and grab a photo with a dried-up shark carcass. The view from the top of the 60m tall sand dunes down to the beautiful ocean. After a late lunch of some really tasty river fish we walked back down to the ocean to enjoy a wonderful sunset and then got ready for another night in hammocks. Hopefully sans donkey running past at 3am this time. The very stuck fuel truck that had been there for four days already. 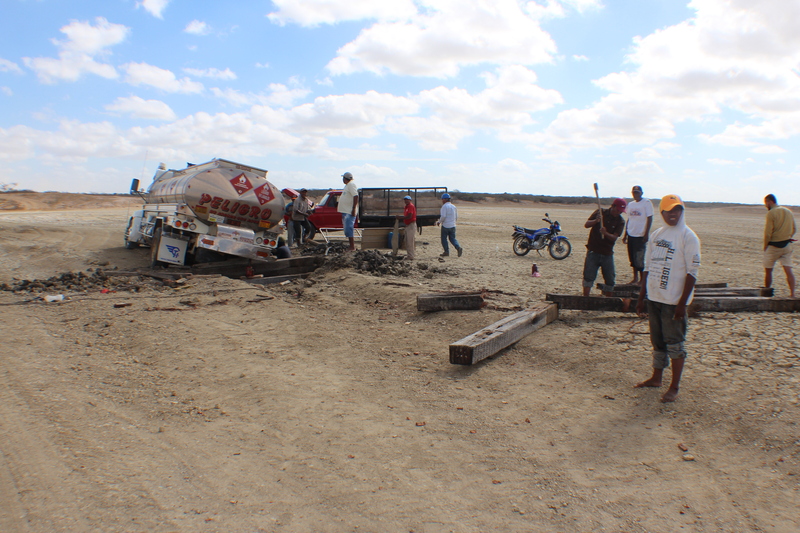 The next morning we had a bit of a later start to return the couple hours back to Cabo de la Vela and happened to pass by a fuel truck that had become stuck in the desert. Although it was hot, dry and incredibly windy while we were there, the area actually has two rainy seasons and you cannot cross the desert by vehicle but must take a boat. You can see signs of deep tracks and vehicles that have been stuck before, but the driver of the fuel truck really did it in. The truck had been there for four days and as we passed by we stopped to see how progress was being made to dig it out. Lot’s of work in the heat for the locals and who really knows when they’ll manage to get the truck unstuck. 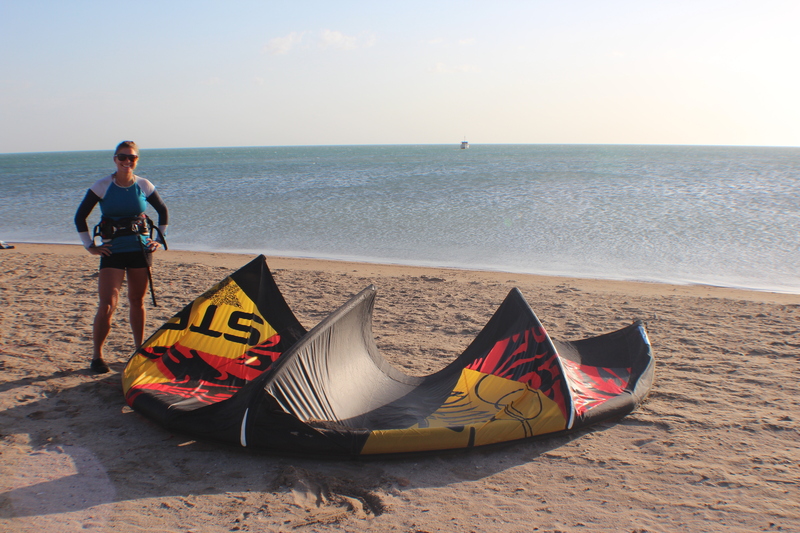 With an afternoon to kill in Cabo de la Vela and not much else to do but enjoy the scenery or nap in a hammock, we grabbed a delightful lunch of goat and a few beers and then I decided to try my hand at kitesurfing for the first time, taking advantage of the non-stop wind. Two years ago in Vietnam I had wanted to try it out and decided it was too expensive. After regretting not doing it then, I couldn’t pass up another opportunity so I paid for an instructor and spent three really fun hours learning how to fly first a trainer kite, and then the bigger one. I even was able to start working on body dragging in the water before the sun set. Definitely worth every penny I paid for it. For our last evening in Cabo, we enjoyed another fantastic lobster meal and one more night in a hammock (I honestly quite enjoy sleeping in hammocks once you get used to them). It was going to be another early morning and I had a long travel day ahead, trying to get from Cabo all the way to Cartagena, about 11 hours of travel by various modes of transport. While not the easiest place to get to, the journey up to a wild and remote area in Northern Colombia was an incredible experience and adventure and I was rewarded by one of the most unique landscapes I’ve encountered thus far. If you ever happen to be in Colombia and get the opportunity to head up there, I’d highly recommend it. ← Previous Previous post: Have I Gotten Old?